The one year old dog was dumped in a park suffering horrific pain from having her ears croppped to make her appear fearsome, as well as enduring the effects of intensive breeding. Animal welfare charities warned last year of the increasing torture being inflicted on dogs so they appear like fighting breeds to fetch vast sums on the black market. Sadly, the cruelty involved producing the muscular, barrel-chested dogs that are then hacked about with knives and pliers leads to victims like this pitiful young pet. The Scottish SPCA today released photographs of the young black and white “pocket bully” before she was destroyed as the charity launched an investigation into her abandonment in Strathclyde Park, North Lanarkshire, earlier this month. An undercover officer from the SSPCA’s special investigations unit described how a member of the public who spotted the young immediately dog knew something was wrong. 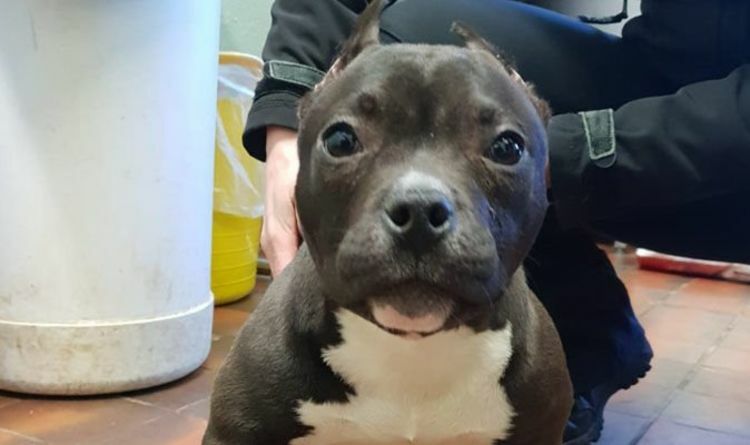 The officer explained: “The pup, who had cropped ears, also had multiple congenital defects which had a painful and severe impact on her wellbeing. Cropping the ears of dogs and subjecting them to cruel fitness regimes to increase their muscle tone and stamina give animals the aura of being fighting animals. American pit fighting gangs have long clipped the ears of their bull breeds to stop the animals having them ripped off in the ring. It is illegal in the UK under the Animal Welfare Act but that has not prevented increasing numbers of British dogs having the procedure carried out by untrained hands. The undercover officer continued:“To add to the status symbol of these dogs, it is a growing trend in the UK to crop the dogs’ ears. Any surgical procedure carried out for purely aesthetic purposes is illegal. Last year animal welfare charities reported how they had seen a surge in the number of dogs with cropped ears being reported to cruelty lines. The RSPCA urged the public never to buy dogs that had been mutilated as it reported a 157 percent rise in calls about animals displaying the “look”, with many of the animals being sold on social media or at shadowy back street breed shows. The charity’s dog welfare expert, Dr Samantha Gaines, warned: “Ear cropping is a process where ears are removed or surgically altered, for the purposes of appearance. It’s a painful, unnecessary and does not benefit the dog in any way. “We don't believe dogs should be mutilated for cosmetic purposes. There is a concerning trend for certain breeds to have cropped ears such as American bullies, cane corsos, presa canarias and dobermans. Often, dogs are having their ears cropped at six-weeks-old. “Dogs with cropped ears can have ongoing and unnecessary health issues, such as wound infections. The SSPCA is keen to trace the person responsible for abandoning the puppy in Strathclyde Park as well as about the ear-cropping.